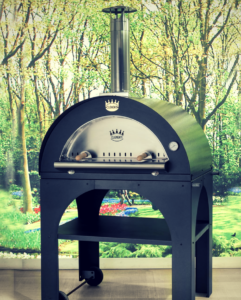 The Clementi Pulcinella Pizza Oven is a fantastic wood fired pizza oven and is perfect for entertaining and cooking for friends and family on a sunny day! Whether you want to slow roast beef, stew pork or craft pizzas only worthy of gods, then you can do this simultaneously with the multi cooking feature on the Clementi Pulcinella. This can speed up any cooking process, and the Pulcinella offers the best standards, making it one of our favourites and one of the most reliable pizza ovens. Furthermore, the stand which it comes with 2 wheels attached making the outdoor pizza oven portable. This is great when wanting to change the position or place of the pizza oven in your garden. You can also dismantle the stand and detach it from the pizza oven itself to place it on a worktop, or if you wanted to move it to a friends house you can. 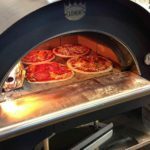 The Clementi Pulcinella pizza oven kit is wooden fuelled so still holds the traditional aspect of pizza making, along with the curved and shiny finish, the combination is eye-pleasing. Making pizzas will feel like a truly luxurious process.